Last week, I was in a time crunch. I only had 45 minutes to get a full meal on the table, and I didn’t have time to go shopping and it had to be a tasty and satisfying meal. Also, I was craving comfort food (Fall/Winter always makes me crave comfort foods!) I had to work with what was in my house … luckily, this is my specialty. This is the magical meal I came up with. Serves two. First, I switched the oven on to 375 degrees Fahrenheit. 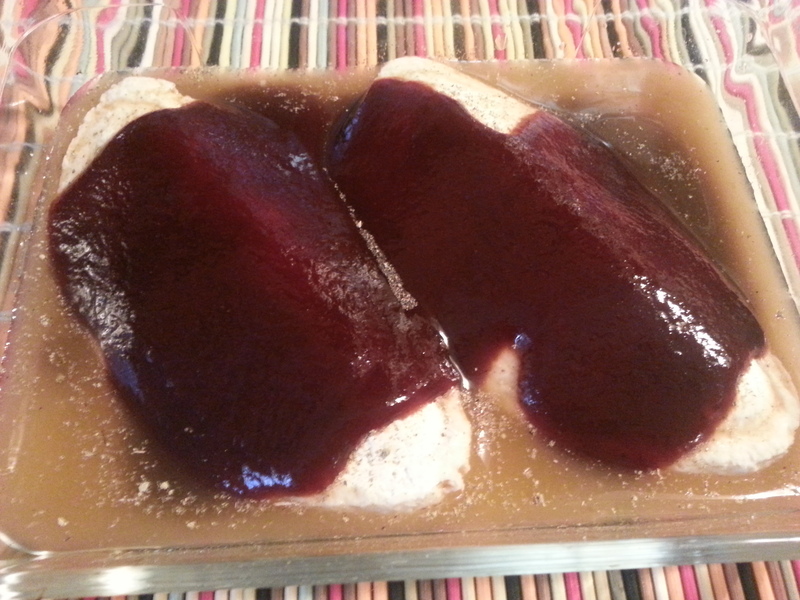 Then, I quickly grabbed a small glass baking dish, threw down the cutlets, added the vegetable broth around the cutlets, seasoned the cutlets with the salt,pepper, and poultry seasoning, and then topped it all with a good pour of BBQ sauce over each cutlet. I then threw that in the oven. 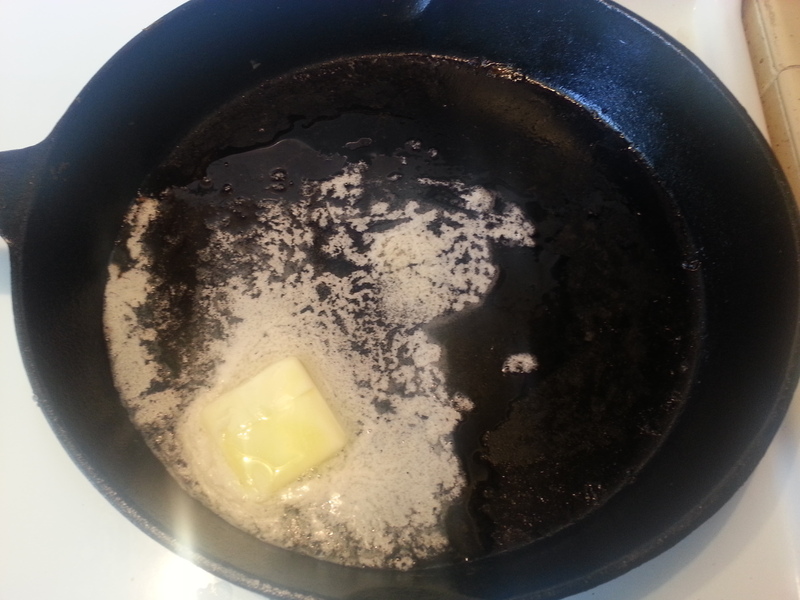 I simultaneously threw the cast iron skillet into the oven as well to warm it up. 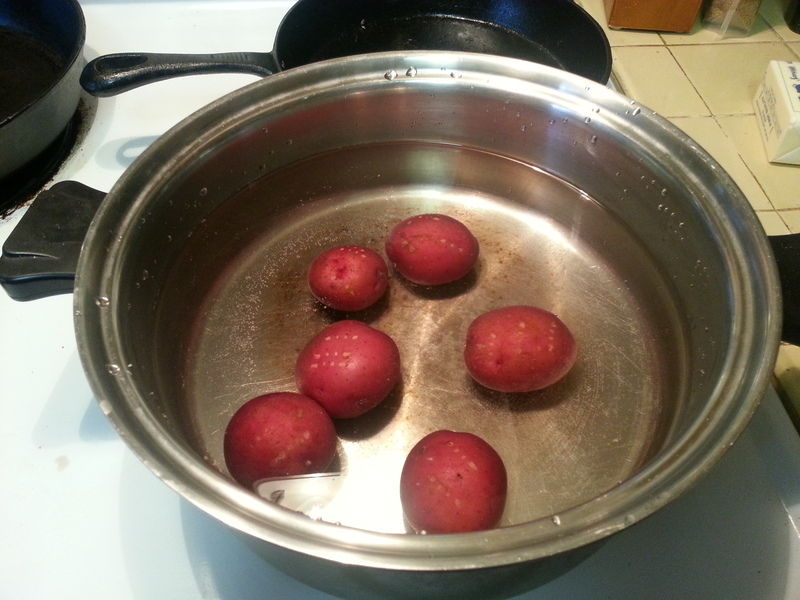 Next, I filled a large pot with water, seasoned it with salt, and then threw in the red potatoes which I poked with a fork. Turned, the burner on high and brought that to a boil. 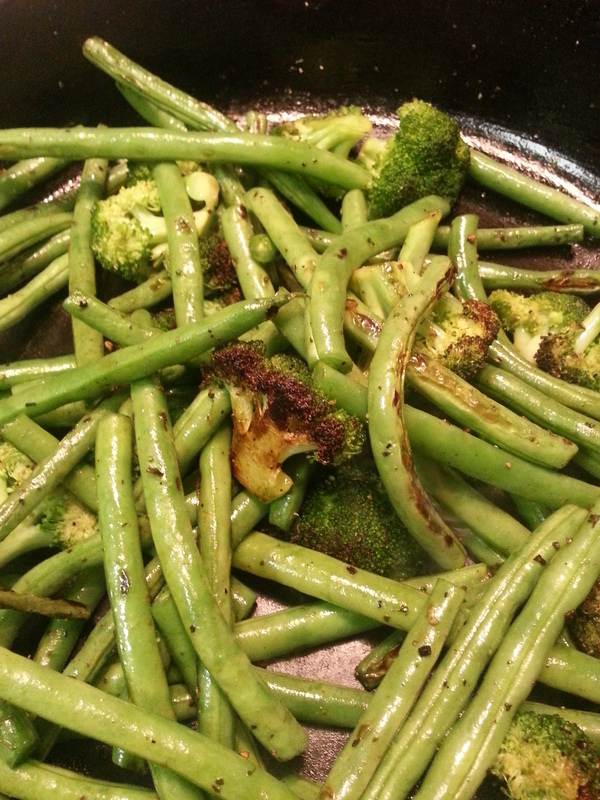 Next, I threw the broccoli florets into the steamer pot. 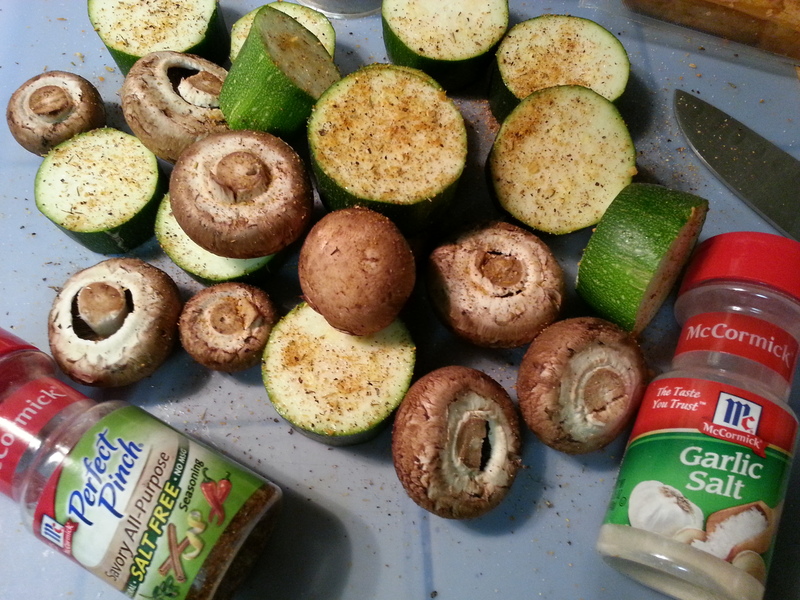 (notice the amount of “throwing” in this recipe … it denotes just how fast I was working). 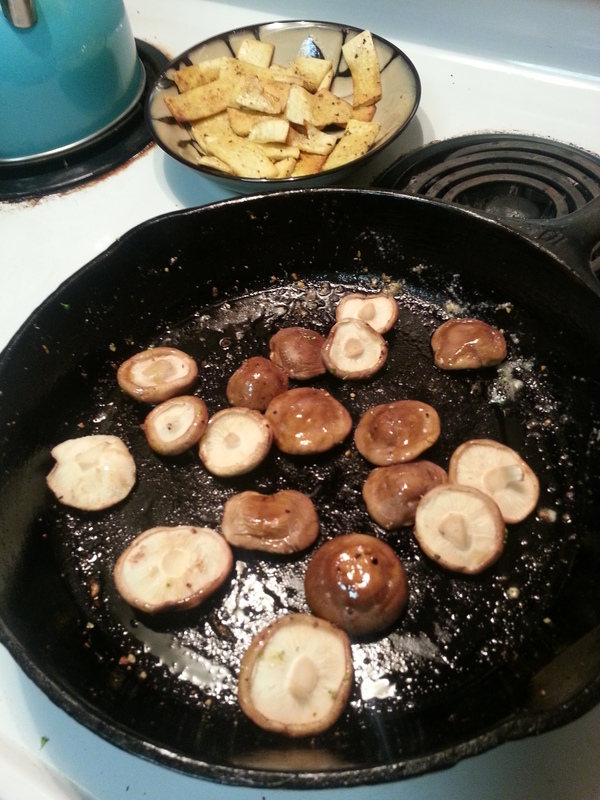 However, I did not turn on the burner to the broccoli. That will happen when there is about 10 minutes of cooking time left. I kept checking on the chik’n to make sure I wasn’t burning it. After the potatoes were fork tender (about 20 minutes or so), I drained the potatoes, and took the cast iron skillet out of the oven and put the skillet on a burner set to medium. 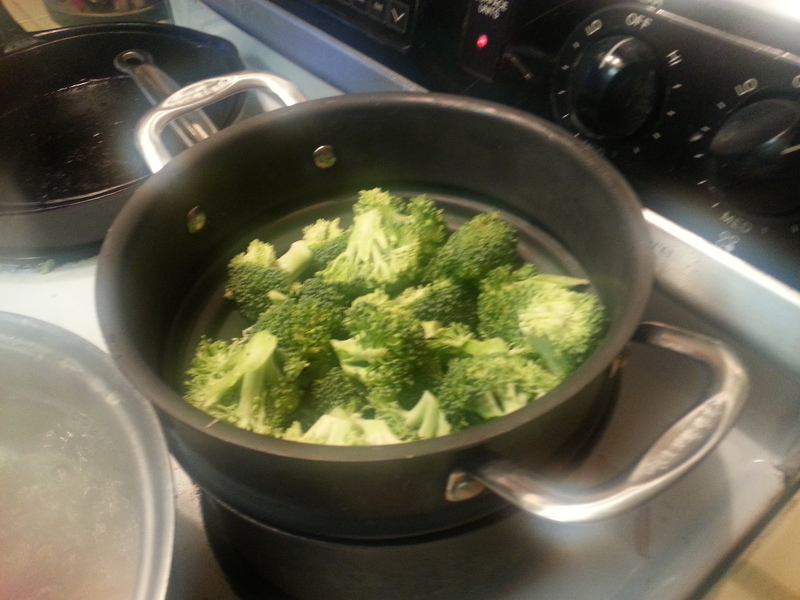 NOW turn on that burner for the broccoli to high to get the steaming going. 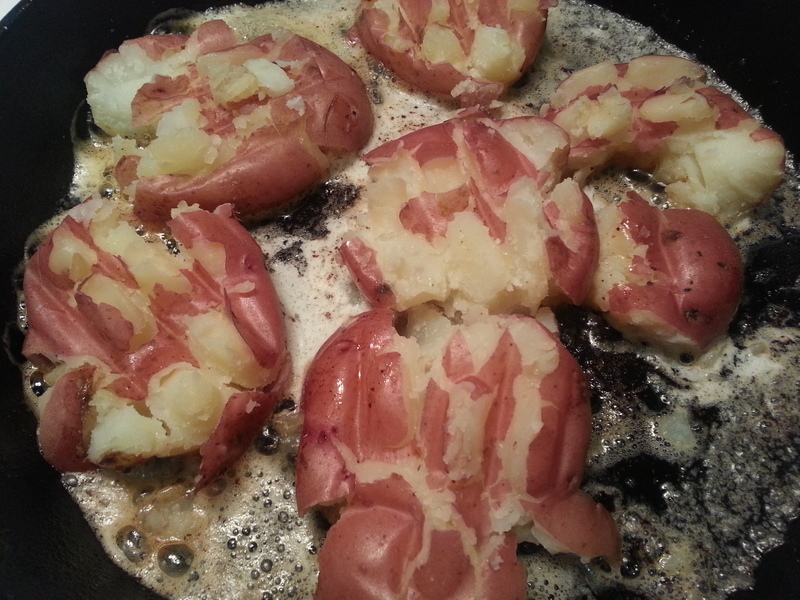 Put a couple tablespoons of oil or butter in the skillet, and then add the whole potatoes. 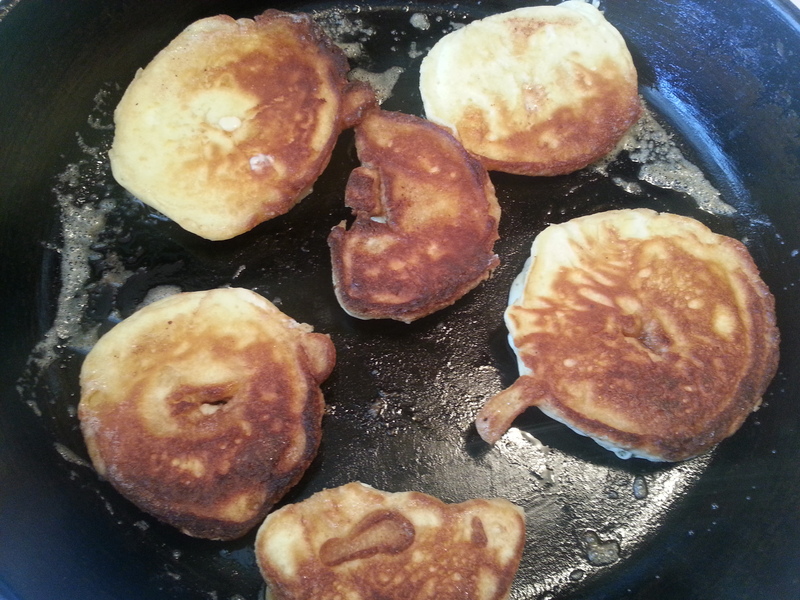 Get out your potato masher, and squish the potatoes so they look something like this. 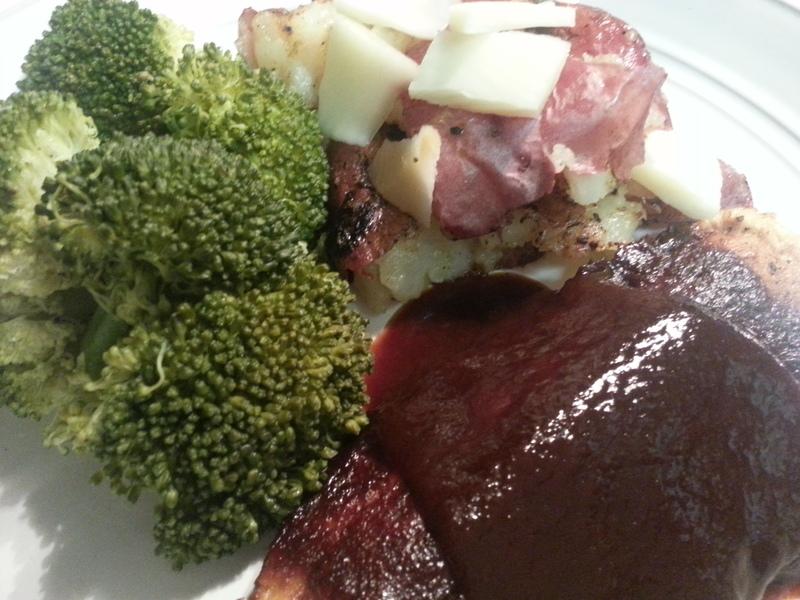 Now take the bbq chik’n out of the oven, and plate up that dinner! I added some more bbq sauce on top. Who says quick can’t be delicious and satisfying? What are your favorite go-to meals when time is on the line? I’d love to hear about it in the comments section. What goes great with chilly weather? 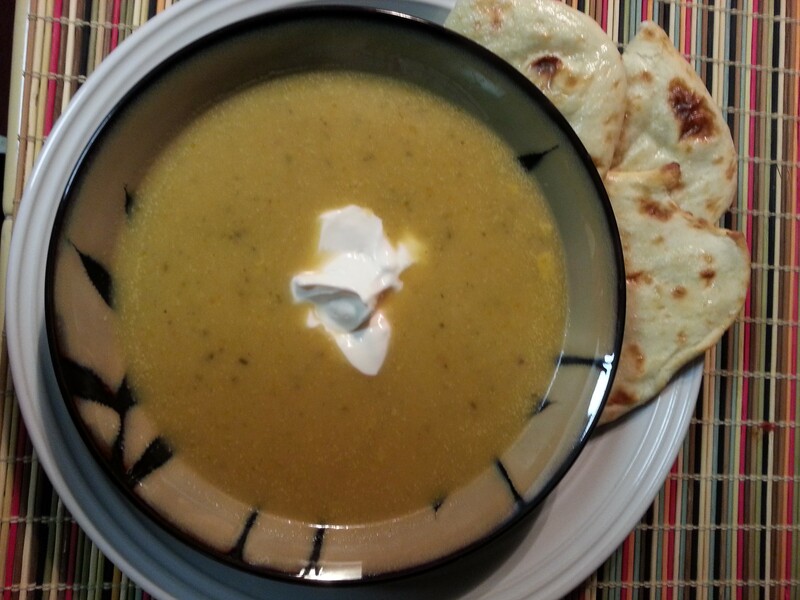 Fluffy sweaters, flannel blankets and warm creamy soups! I came home yesterday and whipped up this little number. I hope you enjoy it! Serves 4. Use organic ingredients when you can. 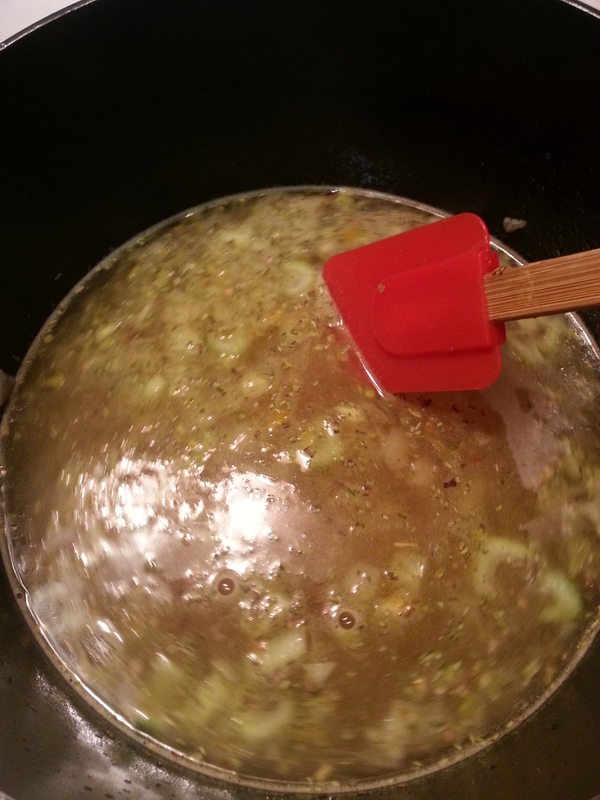 First, give the bottom of your soup pot a good swirl or two of olive oil. Add onions, cook for 3-5 minutes, add celery, carrots, cook for another 3 minutes. 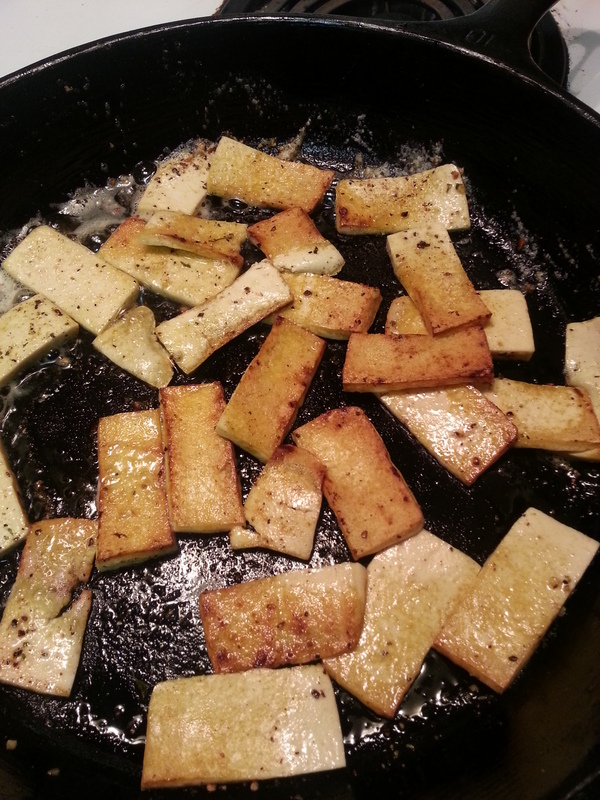 Then add the broth, garlic, rosemary, bay leaves, and about half of the potato cubes. 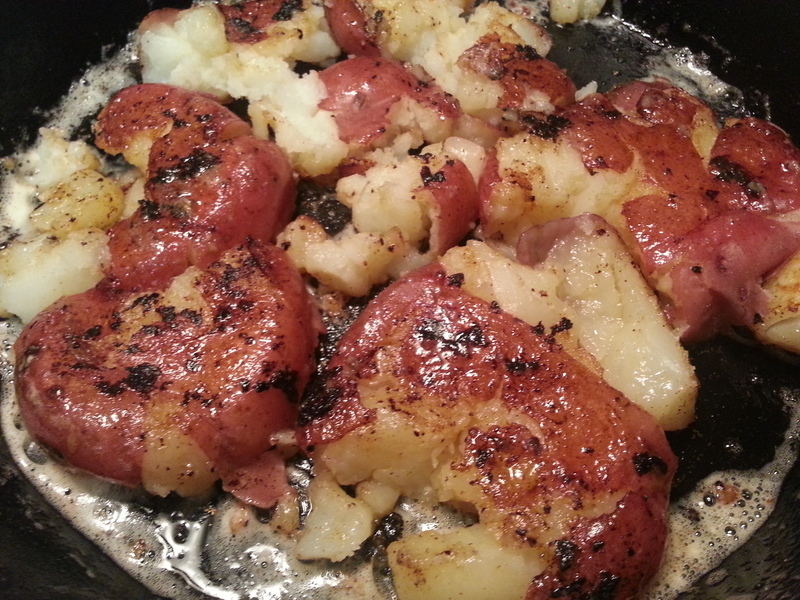 If you don’t want your potatoes to oxidize, cut and cube half of your potatoes for this part. Then we will put the other half in towards the end of the cooking process. Cook for 30-45 minutes. I had time to kill until my sweetheart got home so I cooked mine for about an hour. I’m sure this recipe could be cooked in under an hour. 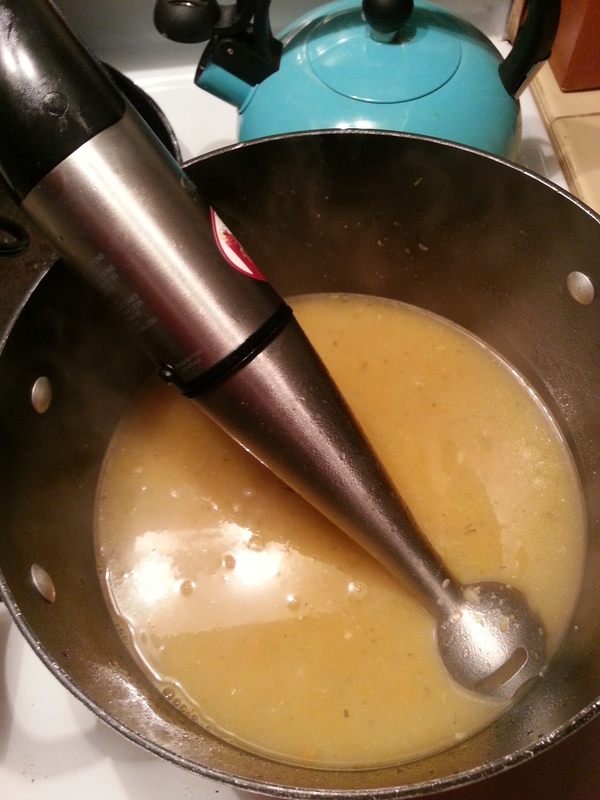 Then get out your stick blender or regular blender and blend it all together to create the creamy base for your soup. 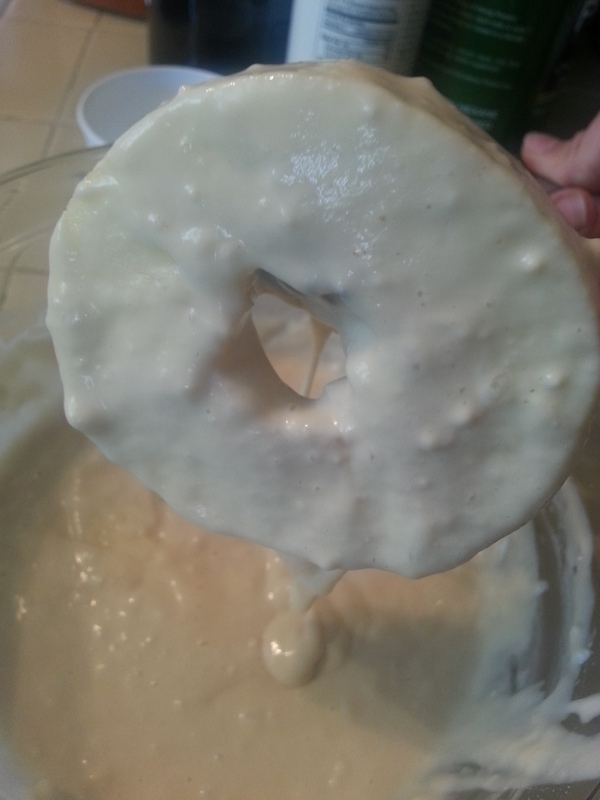 If you use a blender, make sure to cool the soup slightly before blending. I used my stick blender and shoved it right into the pot on the stove. 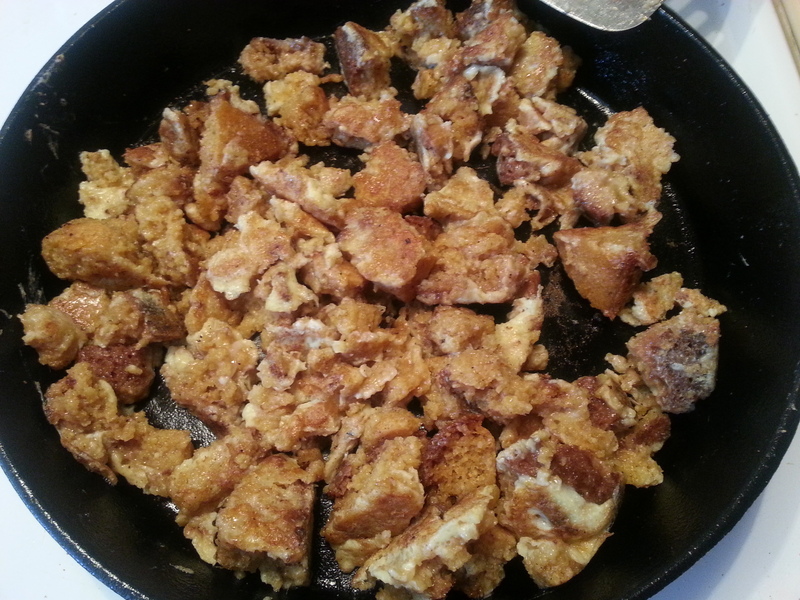 Now add the milk, nooch and the rest of the potato cubes. 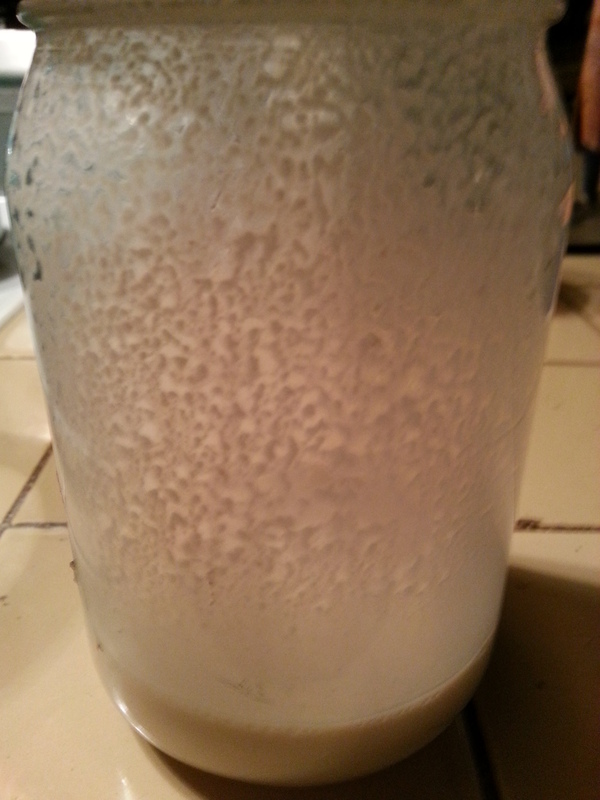 Next, you’ll want to make a slurry in a jar using the 2 T. of flour and about 3 T. of water (or milk). 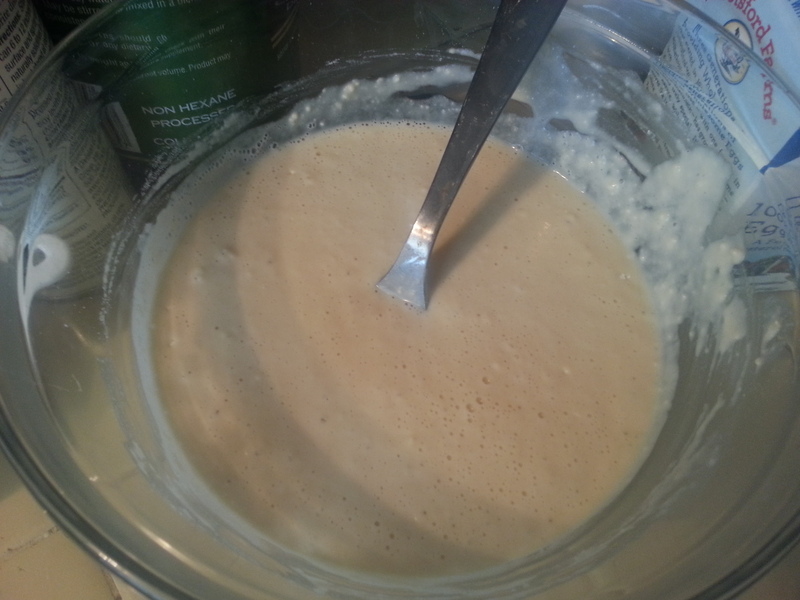 A slurry thickens the soup, so you want to put the water and flour in a jar, put the lid on tight and shake it up, now add that to your soup. Cook for about 20 minutes until the potato cubes are soft and the soup is slightly thick and creamy. Make sure to check your seasonings … I found mine needed some additional salt and pepper. What’s your favorite way to stay warm? I would love to hear your thoughts in the comments! For most of my life I’ve been itchy … dry skin, allergy rashes … you name it. All I was ever told by a doctor was to not take hot showers, put on lotion twice a day, and avoid things I’m allergic to (food, insects, etc.). No one ever stopped to wonder if it was just the food allergies or if there was more to the story. Now well into my adulthood I have finally stopped to wonder if there was more I could do for myself. Although I can attribute some of my skin itchies to food allergies, I think dry skin is mostly to blame. Despite eating very well, I still find I have dry skin. And no matter how much store-bought lotion I put on … it never helps. I had to figure something else out. My Sweetie has me on wonderful supplements, I take flax seed oil and safflower oil daily … so I’m nourished from the inside. But what about the outside? Fortunately, there are relatively inexpensive all-natural ways to take care of that. I only recently discovered the magic in natural oils. I wish I had found them sooner! Recently, I’ve been messing around with different combinations for my skin. The one I’m going to share with you is a great combination of oils for my dry skin. It goes in an old lotion bottle that has a pump. I personally love the pump over a jar … much more user friendly. I find that this particular one is best used when you get right out of the shower when your skin is still hot and your pores are still open. I simply pump as much as I need into my hand and rub it all over. I wait a little bit before I get dressed so it absorbs into my skin and not my clothing. Melt your coconut oil. 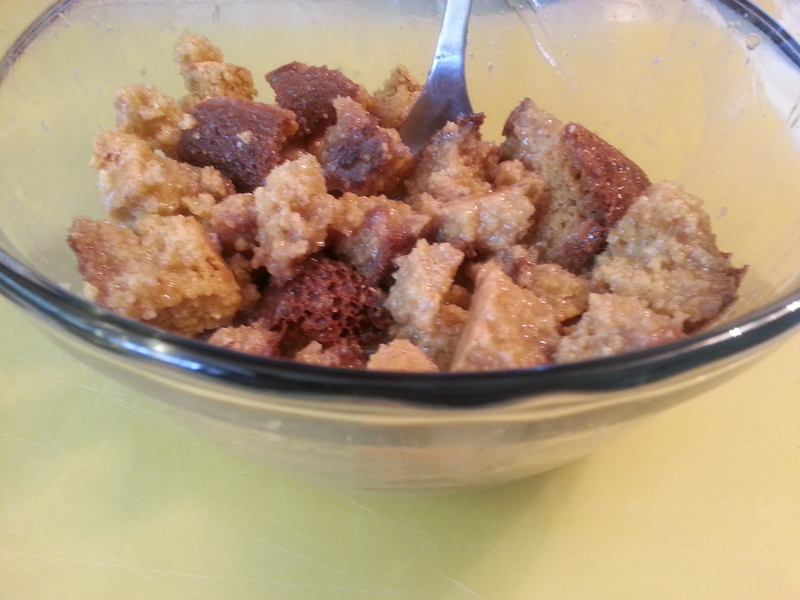 You can do it in the double boiler or the microwave. 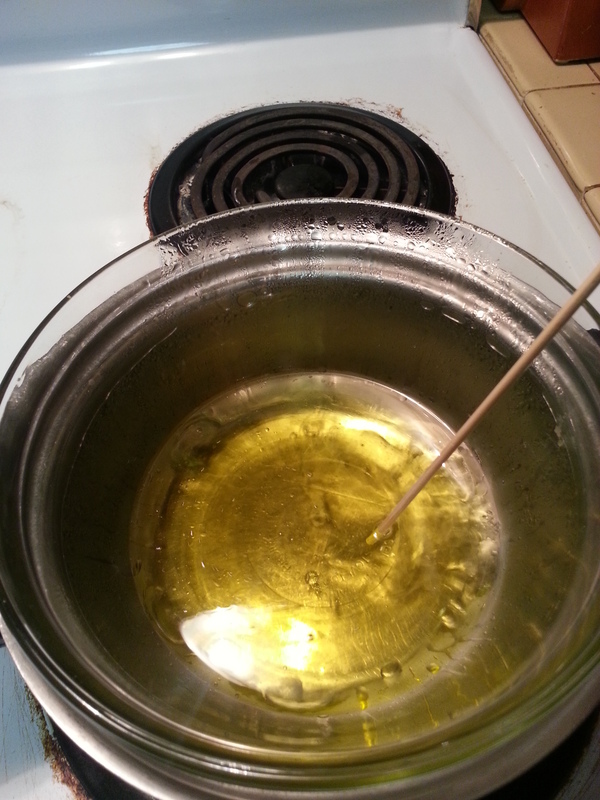 If you don’t know what a double boiler is check out how here. You simply fill the bottom pan with 1 inch or so of water, place the other container/glass bowl on top… and melt stuff in the top part. Remove from the heat. Add olive oil, jajoba oil, and rose hip oil to the coconut oil. Stir to combine. Now you can add the essential oil of your choice for scent … lavender, etc. I prefer mine unscented. 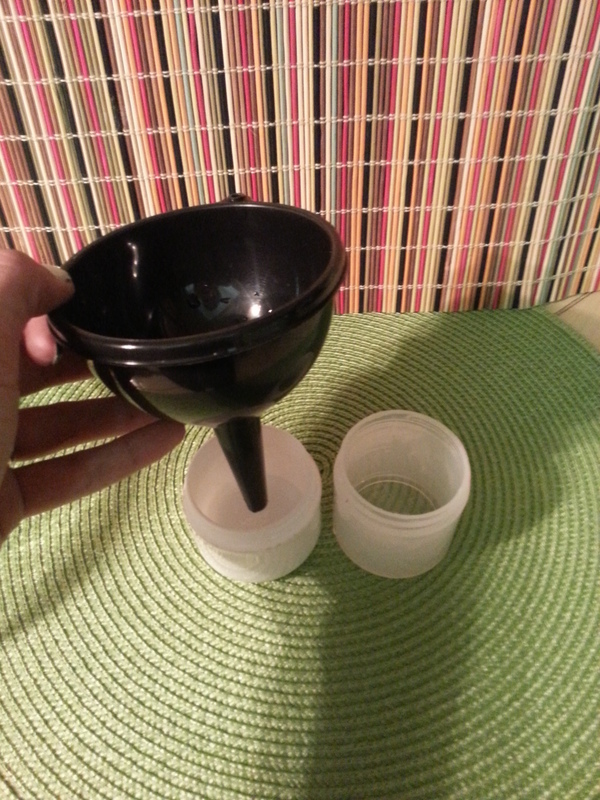 Next, use the funnel to pour the oil into a container. Let it cool and it is ready for use! I used these small containers just to show you as my lotion pump was already full. When I start to run low, I will use these as refills. 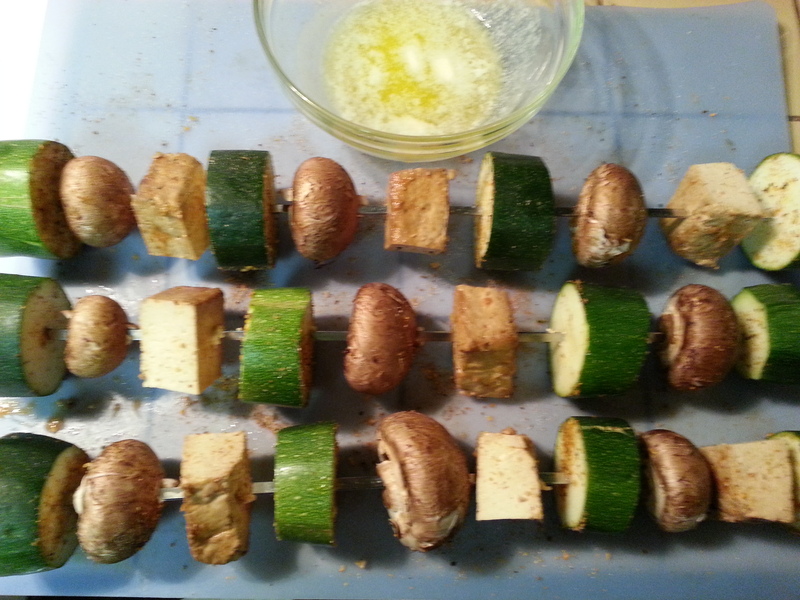 Note: this is merely one combination of oils … I’ve experimented with several different combinations. I personally enjoy this one because it will work in my pump bottle and it stays liquid. 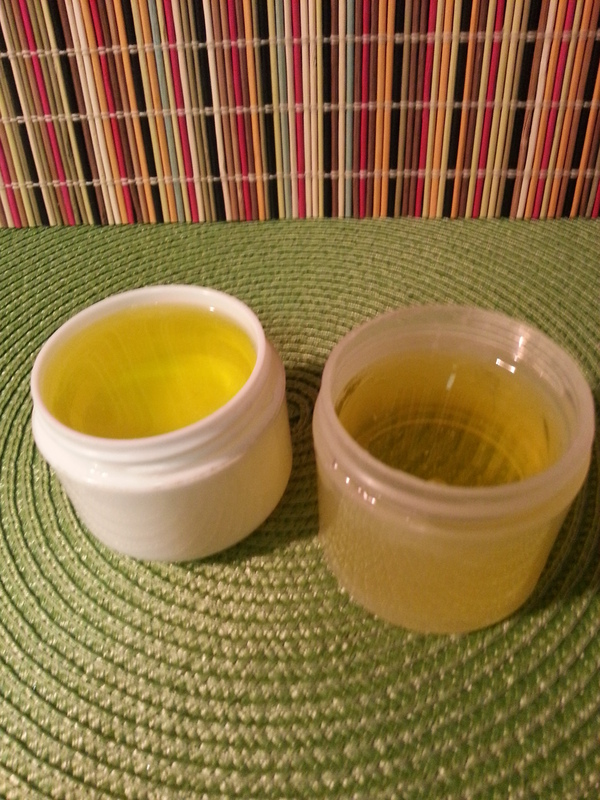 Anything with lots of the ‘hard’ oils in it … such as coconut or shea will harden when it cools. I will keep experimenting and let you know of any new discoveries! What’s your favorite moisturizer? Leave any questions in the comments! 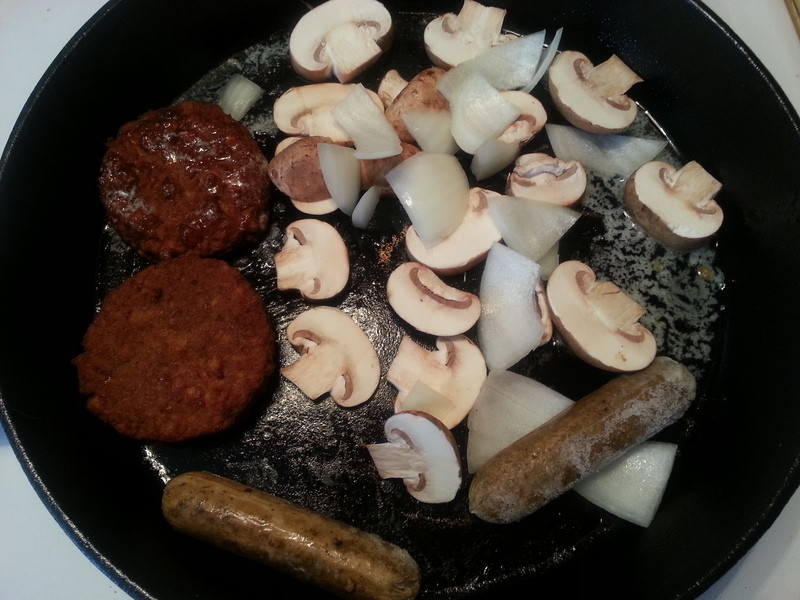 2 Morning Star Black Bean Chipotle Burgers – or any veggie burger of your choice. These just have incredible flavor. 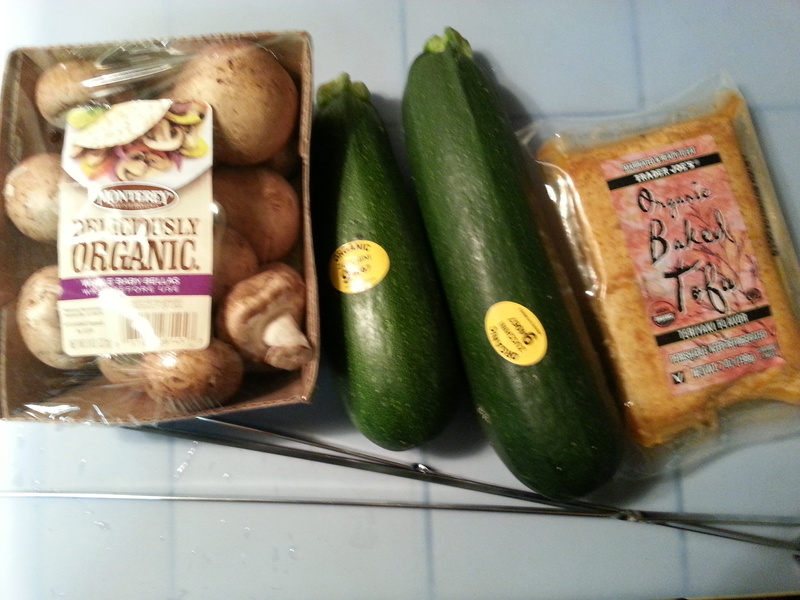 Note: All veggies are organic. Serves two. 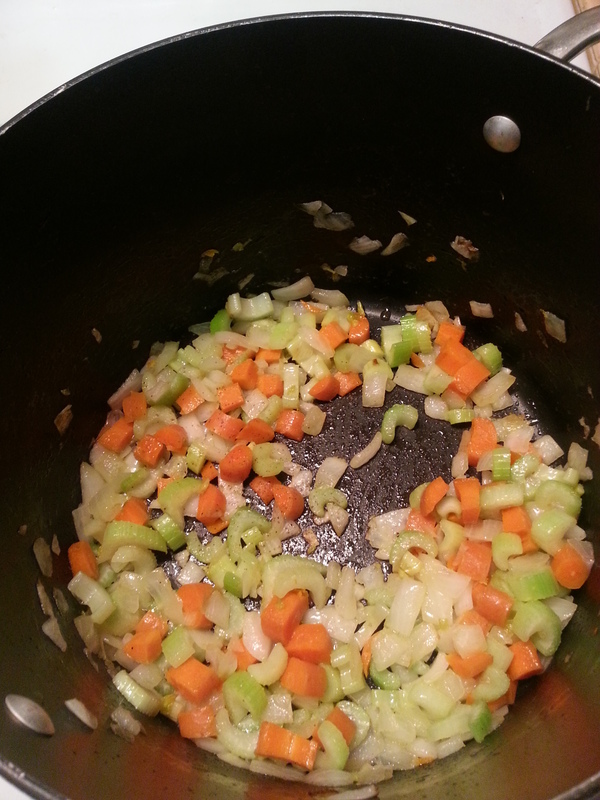 Chop up the onion, celery, carrot and garlic. Put in the bottom of a heavy stock pot with a turn or two of olive oil. Cook on medium until onions are translucent. Then season with salt and pepper. 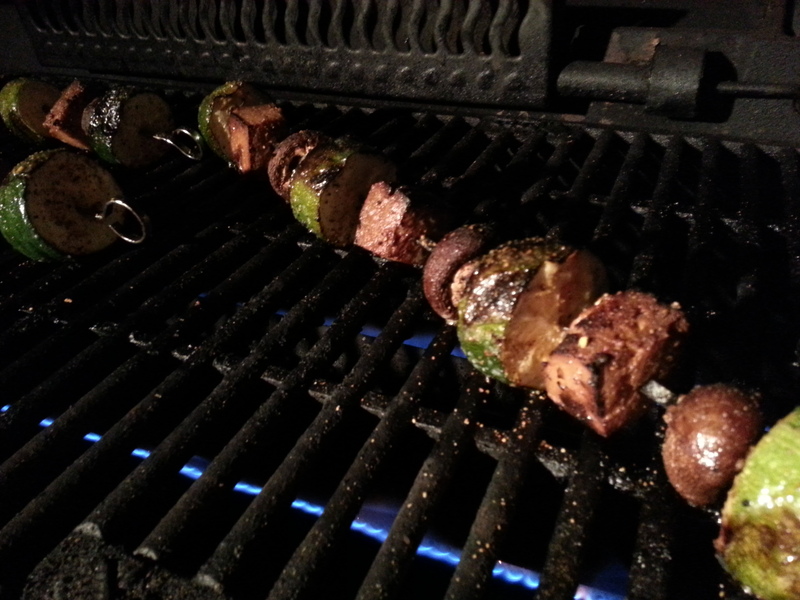 Continue to cook for a few more minutes. Meanwhile, prepare the stock. Since mine came from a base, I needed to reconstitute it with water. I added about 1.5 tsp. of base to 2 cups of water. I then added 1 bay leaf, and 1/2 tsp. each of rosemary and thyme. spices, and lentils. Bring to a boil. Reduce to a simmer. Cook until lentils are tender but not mushy. Then grill or pan fry your burgers. Put the goat cheese in a small bowl and warm at 20 second intervals in the microwave to get it all creamy. 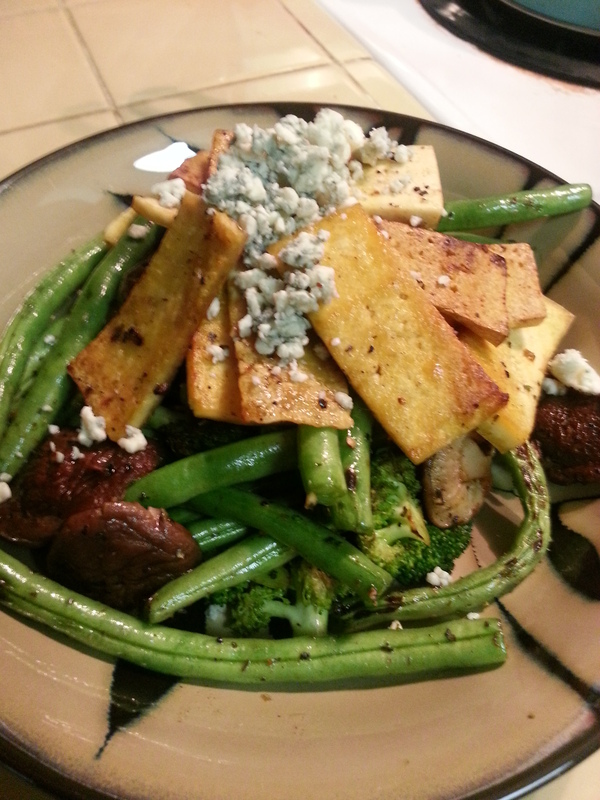 Take your plate and make a bed of the greens on it. 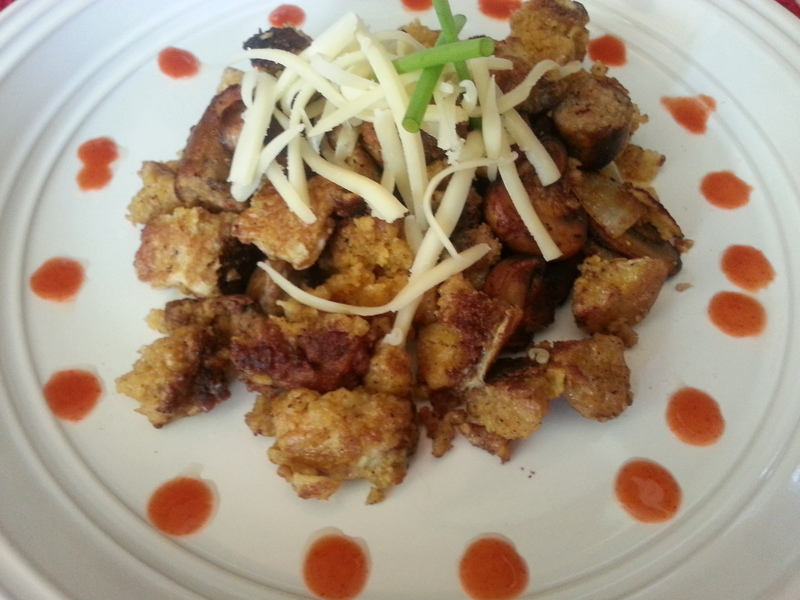 Drizzle with dressing. 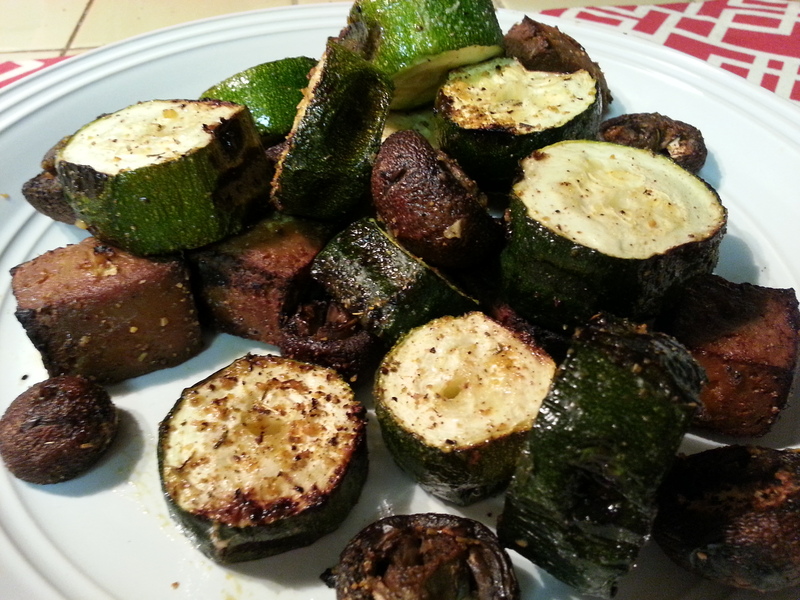 I drizzled mine with olive oil, balsamic vinegar and then seasoned it with salt and pepper. When your burgers are done, place them on the bed of greens, then spread a layer of the creamy goat cheese over the top. 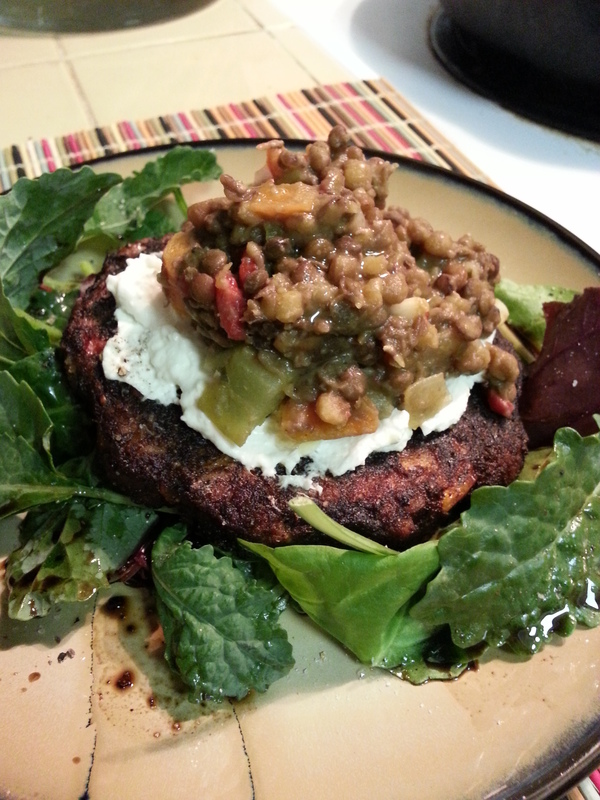 Finally, top the burger with a scoop of lentils and serve. 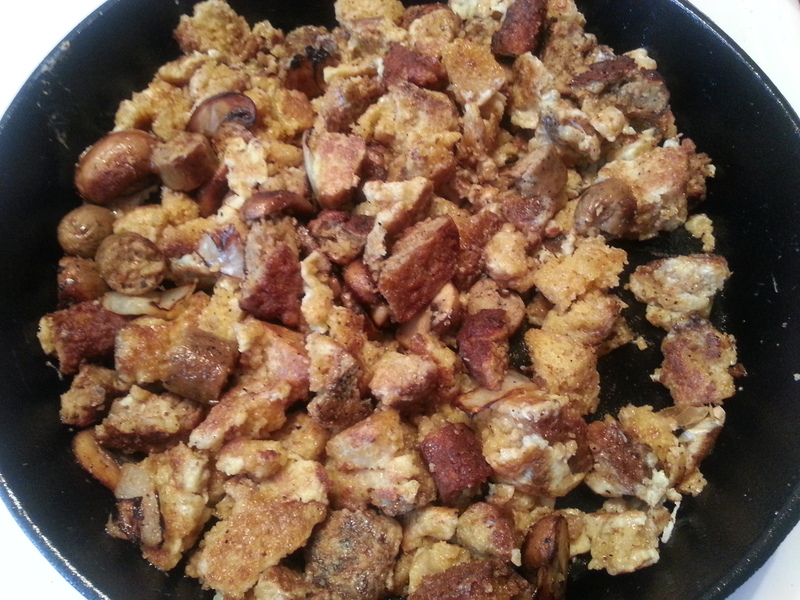 I threw this together on a whim and had no idea whether it was going to be tasty. Luckily, my Sweetie approved it! And once again, there were no leftovers except for a bit of lentils. Do you like to just whip up meals without a recipe? Or do you have to follow a recipe? Please comment. Fall is one of my favorite seasons … and also the time of year when the two apple trees in my back yard are bursting forth with their bounty. With this comes the conundrum that most gardeners face … what to do with all those apples before they go bad. Although apples are a hearty fruit, they do not keep forever. I have been staring at these four bags of apples in the kitchen with dismay as to what to do with them. 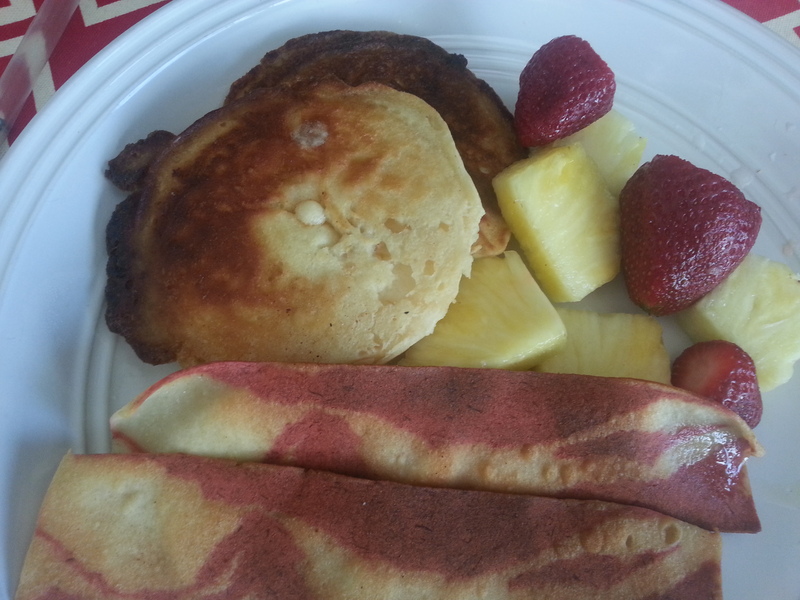 I have been so busy, and hardly have time to slave in the kitchen all day. 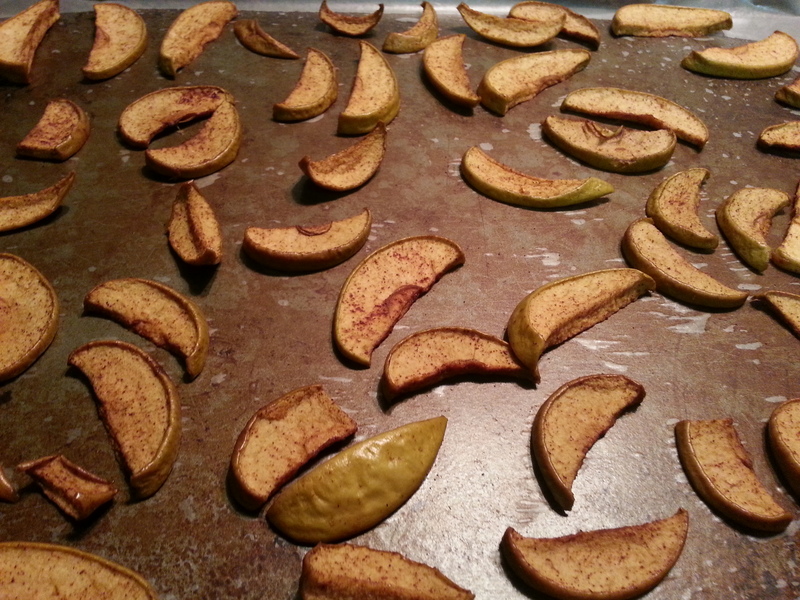 Then I saw a post by Rural Spin for Dried Cucumbers and that got me to thinking that I could apply the same method to my apples. As most of you probably know, organic dried apples or organic apple chips at the store can cost a fortune. Here’s my at home version that doesn’t require a fancy dehydrator. All you need is an oven and some time to kill. 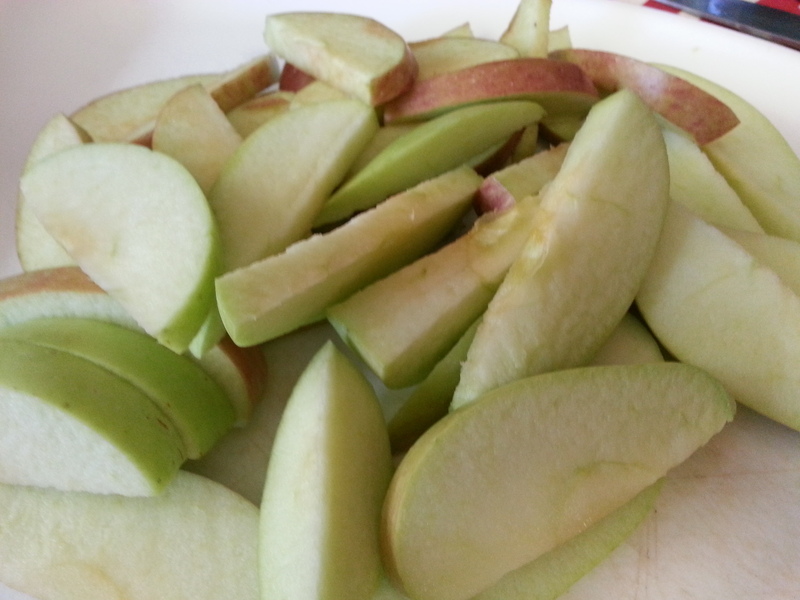 Cut up the apples into thin slices. Or use a fancy mandoline slicer (which is on my list of kitchen gadgets to buy) to get a more even cut. Add the oil to the bag. Shake as much or as little cinnamon as you like onto the apples. Now make sure there is some air in the bag. 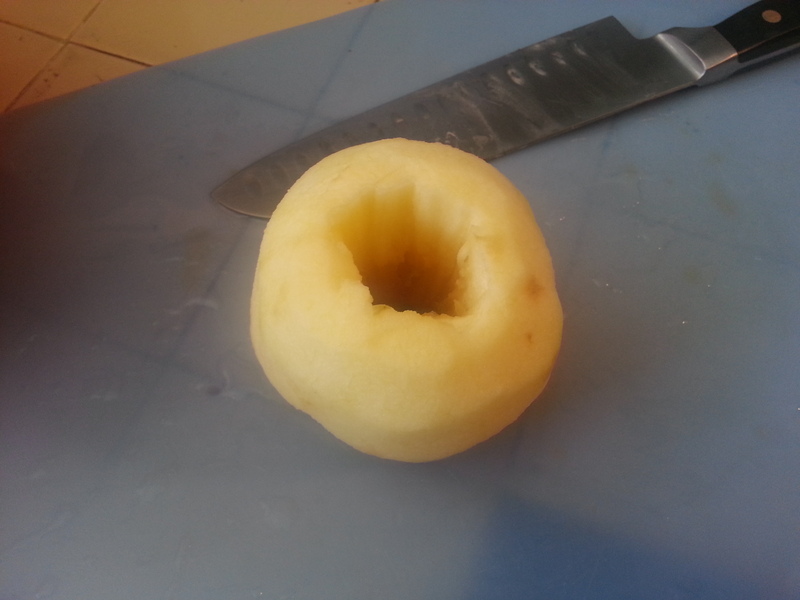 Twist the top closed so you make what looks like a balloon filled with apples, and get shaking! Open the bag and peer inside and see if the apples look like they are evenly coated with the oil and cinnamon to your pleasing. If so, start laying them out in a single layer on the baking sheet lined with wax paper or use the wire racks (no paper necessary for the racks). Bake in the oven for 3-4 hours. 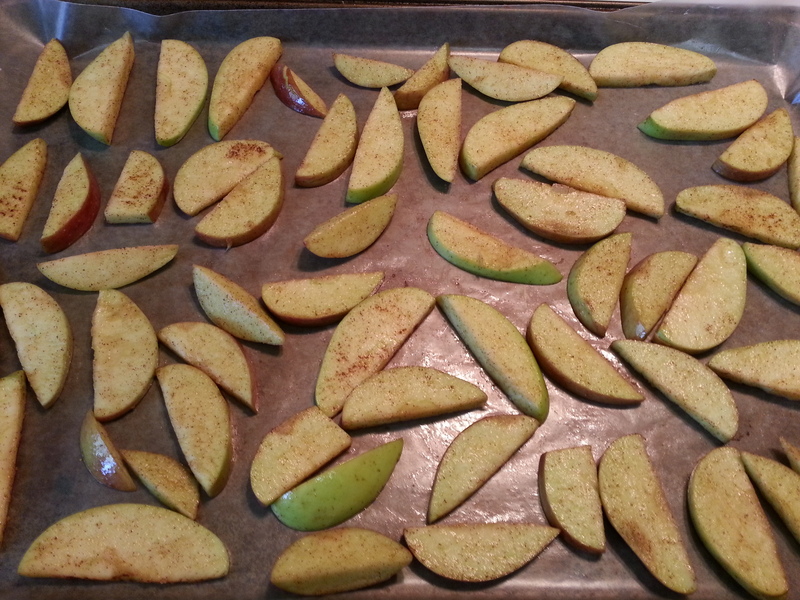 If you like chewy apple slices do less time. If you want them to be more like chips, go longer. This also depends on how thick or thin your slices are. If they are thick, they take longer to get to the chip phase, and it logically follows that if the slices are thin, they will take less time. While you wait for you apple yummies to bake up, curl up with a good book, do some homework (which is what I did), clean the house, or go relax. 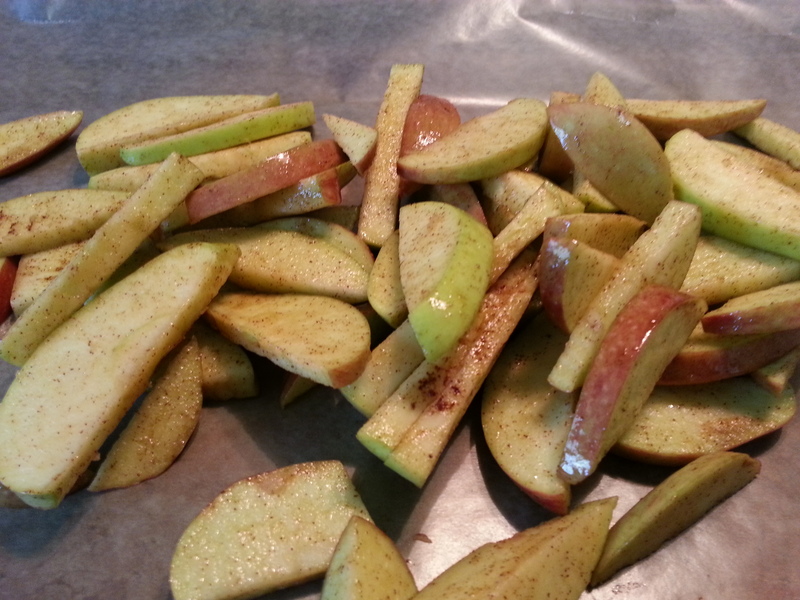 Also, you can put sugar on the apples, too. I chose not to add sugar to keep this a healthy snack. Consuming apple chips is highly addictive and they are certain to disappear fast. It’s best to make another batch! When I went to go try my apple chips, they disappeared into my stomach in a flash. I made three times as much the following day. I felt it was only fair to warn you. 🙂 I hope you enjoy your snack. What’s your favorite fall food? Please share in the comments section. And if you like this, please like and subscribe. Until next time, I send you love, peace, and good energy.